Exhibition sculptures of Gianna Zovi and conference by Hélène Claudot-Hawad, anthropologist. Wearing the “taguelmoust” by Tuareg men, the “Kel Tamasheq”, is an ancestral tradition. Beyond its practical utility, it is also an art and has a symbolic value. 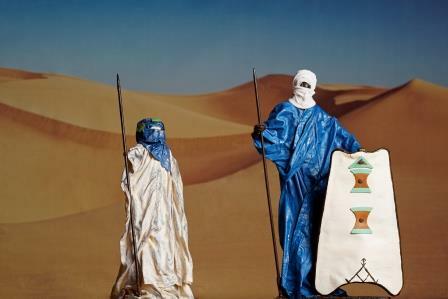 The exhibition of Gianna Zovi’s sculptures will allow us to travel through the different dress customs of the Tuareg, testifying of their warlike past, festive traditions, and their traditional lifestyle which is symbiotic with the desert. The sculptures will also be for sale to the benefit of the association Takrist in support of its development projects in Ibalaghane, a small Tuareg village in northern Mali. The conference by Hélène Claudot-Hawad, Tuareg specialist and wife of the Tuareg poet Hawad, will give, on the one hand, a historical overview on the wearing of the turban, its meaning, its status, its aesthetic styles, its architecture and its texture and, on the other hand, it will help us decipher its codes, the gestures that accompany it and its evolution in modernity.